The following article appears in the 2005–2006 issue of AeroAstro, the annual report/magazine of the MIT Aeronautics and Astronautics Department. 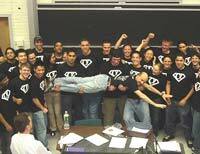 © 2006 Massachusetts Institute of Technology. World-renowned as an aerodynamicist, and human-powered vehicle expert, Professor Mark Drela is also admired by his colleagues and students as a superb — and fun — teacher. In 1988, Daedalus, a lightweight aircraft designed by MIT Professor Mark Drela, set the world distance record for human-powered flight by traveling 72.4 miles from Crete to the Greek island of Santorini. That accomplishment put Drela on the map as a leading expert on human-powered flight. However, even more significant than the world record was the advance in computational aerodynamic design that went into building Daedalus. It ensured Drela would be recognized as one of the best aerodynamicists and airplane designers in the world. To design and test Daedalus, Drela developed a software program called XFOIL. A kind of MATLAB for aerodynamicists, XFOIL wrapped established computational techniques for airfoil design in a graphical, intuitive interface. The program’s ease of use and reliability enabled the Daedalus team to test and retest aircraft designs much more rapidly than previous, more cumbersome programming methods. Like MATLAB, XFOIL “does all the grungy details for you, so you can think more conceptually. And that really fits into how engineers do their job,” says Drela. Drela not only designs human-powered aircraft, but has also engineered aircraft for Boeing, the wing for the Predator UAV, the keel of America’s Cup yachts, and experimental aircraft used by NASA. 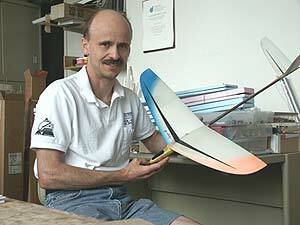 In addition to XFOIL, he has written design programs for rotorcraft, machinery blading, and axisymmetric bodies such as zeppelins. All of these programs have been “developed in actual use, by myself and other people,” he says. Department colleagues point admiringly to Drela’s skill as an educator. “Mark is an awesome teacher and gifted engineer. His lectures and papers are laced with original insight and intellectual nuggets. He is always available – 24/7 – to help any student or participate in any undertaking. Mark is a role model for many of us who try to reach his level of excellence,” says Department Deputy Head, Professor Earll Murman. Drela came to MIT as a freshman in 1982 and went on to receive the SB, SM, and PhD in aeronautics and astronautics. “ I was in aero since I was five years old,” he laughs, recalling building his first model airplane in his native Poland. He attended high school in the Philadelphia suburbs after his family emigrated to the U.S. When he arrived at the Department, the field and its students were shifting focus from “hands-on, hardware stuff” to the computer- and information-science realm of aircraft engineering. Drela melded expertise in both areas to great effect by creating computer software that made aerodynamic design easier and faster. After Daedalus made its unprecedented flight, Drela used XFOIL to design a new record-setting craft: the Decavitator, a human-powered hydrofoil that he pedaled to a world-record speed of 18.5 knots over a 100-meter race course on Boston’s Charles River in 1991. Both Daedalus and Decavitator are on display at the Boston Museum of Science. A recent area of focus for Drela has been modeling very flexible airplanes. 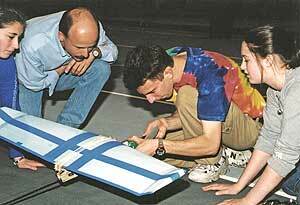 He consulted on an experimental unmanned aircraft called Helios, built by AeroVironment Inc. under NASA sponsorship. Intended as a satellite substitute, the solar-powered craft flies in the thin upper atmosphere two to three times higher than a typical crusing jetliner. For this reason, it must be light and flexible. Nicknamed “the flying noodle,” Helios is essentially a large, undulating wing with several small propellers. Drela plans to continue moving toward the design of vehicle systems rather than components. He is developing a design package that would enable rapid modeling and immediate flight simulation of an aircraft. “This prototyping system will fit well into the CDIO (conceive, design, implement, operate) structure of the Aero-Astro curriculum,” he says.